Ohio Gov. John Kasich (R) vetoed a bill today that would have continued to freeze the state's renewable energy standards. Photo by Gage Skidmore, courtesy of Flickr. This story was updated at 4:15 p.m. EST. Ohio Gov. John Kasich (R) vetoed a bill today that would have made the Buckeye State's renewable energy standards optional, siding with environmentalists over the Republican-led General Assembly. The veto effectively restores Ohio's requirements for renewables and energy efficiency. Both had been frozen under a 2014 law signed by Kasich. But in a message explaining his veto of H.B. 554, the governor said Ohio's "wide range of energy generation options" had contributed to the state's improving business climate. The bill, Kasich said, "risks undermining this progress by taking away some of those energy generation options, particularly the very options most prized by the companies poised to create many jobs in Ohio in the coming years, such as high technology firms." The standards call on Ohio utilities to secure 12.5 percent of their power from renewable sources and increase their efficiency by 22.5 percent by 2025. Environmentalists hailed the decision, saying it showed a proactive vision for the development of clean energy in the state. "The energy efficiency and renewable energy standards will now be reinstated and will result in lower energy costs, job creation and improved environmental quality," said Jen Miller, the director of the Ohio chapter of the Sierra Club. The veto marked the culmination of a lengthy staring contest between Kasich and Republicans in the General Assembly. Under the Legislature's plan, Ohio's renewable and energy efficiency standards would have become optional. The governor had repeatedly warned lawmakers that he had little appetite for extending the freeze or doing away with the standards altogether. Lawmakers nevertheless passed the measure, saying Ohio should not hamstring utilities with energy mandates at a time when President-elect Donald Trump is poised to take over the White House. Observers said there appeared to be little prospect for a veto override, given that the bill failed to garner enough votes to overcome Kasich's rejection in either the House or Senate. But proponents of the measure predicted this is not the last of the matter, noting Republicans will boast even greater legislative majorities in the upcoming session. "I think the governor's veto will create more risks going forward that more aggressive efforts to undo the mandates will be forthcoming," said Sam Randazzo, an attorney representing the Industrial Energy Users-Ohio, which supported the General Assembly's bill. The standards passed by wide margins in 2008, receiving unanimous approval in the Senate while passing by a 93-1 margin in the House. But they had become the source of considerable political hand-wringing in recent years. 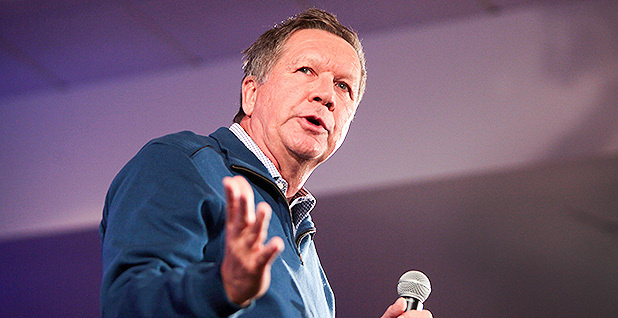 In 2014, Kasich signed a measure freezing the standards for two years. The freeze is set to expire at the end of 2016. The governor also vetoed a $264 million sales tax exemption for oil and gas companies, saying the state could ill afford to lose revenue at a time when its budget is tight.